Damage to your windshield seriously impairs your ability to drive. Any size crack, rupture or chipped glass creates an unsafe driving environment. The risk of an accident is increased with a damaged windshield. Residential and commercial drivers choose PG Van Nuys auto glass repair to restore windshield damage quickly. When damage is restored promptly, further problems and obstructions can be prevented. Hiring a professional company with experienced technicians will get you back on the road fast and increase your level of safety. The auto glass manufacturing industry produces glass that has been tested and judged safe to use in your automobile. This glass may be used for your windshield, doors, back window or sunroof. This glass can still be damaged from severe weather conditions, vandalism and collisions. 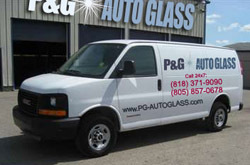 The professionals at PG Van Nuys auto glass repair provide same day and emergency service for any glass damage. The technicians will arrive and provide a free estimate and will give you the lowest price for auto glass repair. Sometimes the cracks, fractures and holes created from damages cannot be restored. A full windshield or window replacement is required. PG Van Nuys car window replacement technicians can arrive within two hours and begin replacing your glass. This service is provided 24 hours a day and 7 days a week to give area residents the emergency service that is required. The glass that is replaced in your vehicle is the highest quality available. The experienced technicians use only OE glass for replacement. This ensures the same quality that is used by your auto manufacturer. Consumer vehicles are not the only motor vehicles that can receive damage to glass. State and county vehicles, commercial buses, school buses and recreational vehicles need prompt and reliable repair service when problems happen. PG Van Nuys auto glass repair service trucks arrive with the tools and replacement parts required to restore any windshield or glass sections. The installation includes a lifetime guarantee and will be free from defects, leaks and cracks. Our mobile service vehicles for auto glass replacement in Van Nuys can arrive at your place 24/7 and our technicians will be able to replace the damaged glass with a brand-new one. If the damage can be repaired, our technicians for auto glass repair in Van Nuys can efficiently and skillfully repair the damage and get your vehicle safely back on the road. Residents of Van Nuys in zip codes 91401, 91402, 91403, 91404, 91405, 91406, 91407, 91408, 91409, 91410, 91411, 91412, 91413, 91414, 91415 and 91416 can trust PG Auto Glass for their auto glass repairs and replacements.